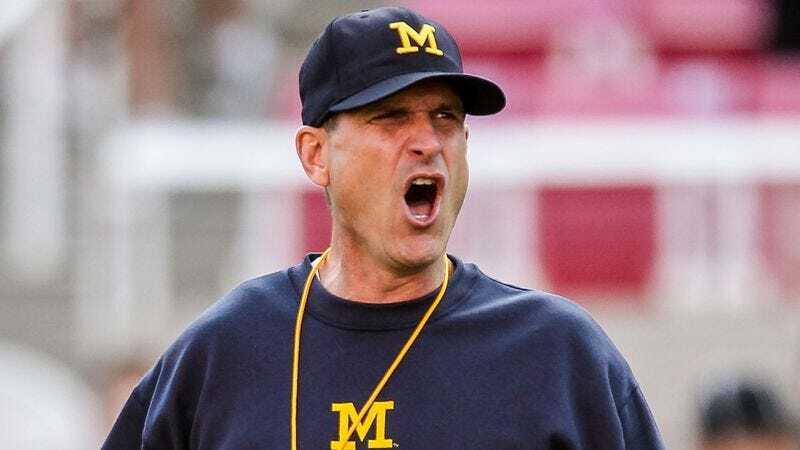 ANN ARBOR, MI—Stressing the importance of physical and mental preparation for their upcoming game against UNLV, a wild-eyed, frenzied Jim Harbaugh reportedly informed all University of Michigan players Saturday that they would have to kill their pregame meal themselves. “You have four hours to track, catch, and slaughter your food before kickoff,” Harbaugh said during a 7 a.m. team meeting, adding that any tools or weapons must be crafted from materials found in the wilderness, otherwise players would have to use their bare hands. “Skipping the pregame meal is not an option. Those who do not catch their meal will not eat.” At press time, deliriously starving Michigan starting quarterback Jake Rudock had tackled an elk and ripped its throat out before frantically feasting on its meat.